This entry was posted in Australian Aboriginals. Bookmark the permalink. Robert E. Howard should have been reading your blog, Greg. My point isn’t that Howard was uninformed, but rather that this would be a premise for a terrifying piece of conquest-horror literature, in a yet unexplored nice of the Hyperborian. They had no pottery, no agriculture, no metals. Not a single luxury. So sub-Neolithic. Paleolithic, I guess. I thought that the aborigines had some low-level agriculture, things like clearing weeds away from useful plants and watering them, though they did not do any actual planting. Do Aborigine Y chromosomes support this hypothesis? No. The Dravidian-speaking Caucasoids of the Indus Valley Civilization were Y haplogroup L. The Veddoid Carpentarians were Y haplogroup C.
You don’t know what kind of Y-chromosomes the Indus people had, because nobody does.. Possibly. A single Y-chromosome type, (C-DYS390.1del/M347), accounts for a very high percentage of Australians and shows low diversity. There has been an analysis claiming that its closest relatives are in south India (and that it arrived recently in Australia), but I would like to see this done again with current sequencing techniques. On the other hand, I don’t think you see a similar pattern with Australian mtDNA. It look old, varied, not bottlenecked. It may be that Tasmanians were “primitive” not because of isolation and regression, but because they did not enjoy the injection of Indian genes. Another anthropological theory down the sink? Although note, the data do indicate that the New Guinea populations also did not enjoy such an “injection”, or any kind of injection (although assuming this holds up, perhaps there may be more in the pipeline). Birdsell was not an idiot – and if he were around to day, he’d make use of the enormously greater genetic knowledge we now have. It would be most interesting to find out what percentage Denisovan the last pure Tasmanian aborigines were. Isolation of a small population could cause regression in intelligence but the faces in the 100 year old photographs of the last pure Tasmanians screams archaic. Anybody can see it. I don’t see how isolation on the large island of Tasmania for 13000 years could cause that. The only rational explanation is they missed out on one or more scenarios of what Cochran has described. I wonder how many readers are old enough to catch the Gilligan’s Island reference? Not having a background in any of the substance of this post, I take solace in recognizing one reference to anything. You were supposed to notice “sobbin’ women” too. Which is itself another reference. Well now that you point it out. But the spelling makes it especially subtle. It’s a reference to a song in “Seven Brides for Seven Brothers” – the song is of course referring to the Sabine women. Which probably goes back to a Proto-Indo-European ‘war of the functions’ – take look at the Aesir-Vanir war in Norse mythology. Another reference, from a previous essay, recently tweeted by Heartiste. When were the comeback boomerang and the woomera developed in Oz: before or after these new chaps arrived? From a quick look, it looks as if the woomera is around 5k old. So on timing grounds it could be that the Indians introduced the woomera. Did that sort of spear-thrower exist in India at the time, I wonder? The Holocene immigrants from India to Australia, the Carpentarians of Joseph Birdsell’s trihybrid theory, were Veddoid, so they would have spoken a language related to the parent Vedda language, not Dravidian. They might have been driven from India toward Australia by the Dravidian-speaking Caucasoids of the Indus Valley Civilization pushing further south into the Indian peninsula. The Veddoid Carpentarians didn’t bring civilization to Australia because they never had it to begin with. The ADMIXTURE in the Supplementary Information to the paper seem to show the Australian samples as having consistent and more or less equal affinities with the Onge and the East Asian like components which are present in the Indian population (under this analysis). 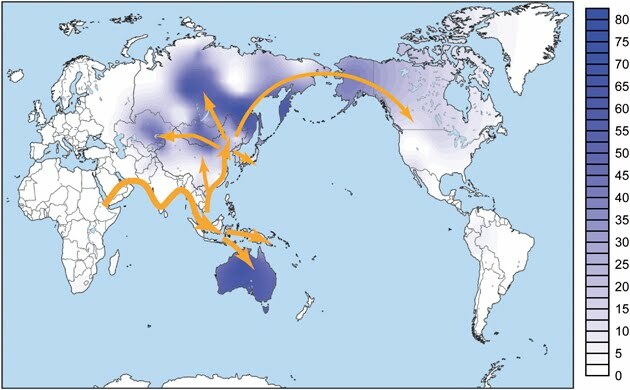 Whereas the samples have highly variable presence of the West Eurasian like components, which would seem to indicate low and variable recent admixture with some West Eurasians. So on that basis, although I am not sure about the precise taxonomy here, it does seem to cast doubt on the idea of Indus or Dravidian like population being involved in any capacity, assuming that Indus had West Eurasian like elements, to any extent (let alone the degree the modern Dravidian samples), which seems at least rather likely..
Their admixture tree may be slightly kludging the presence of a variable level of recent West Eurasian admixture with a consistent ancestral Indian admix in these samples to produce a Dravidian-like admixture signal (although this would not of course bode well for their time scale). You should consider recent genetic analyses more than old guesses by physical anthropologist. Note than I say more, rather than only. Quite a few of those old physical anthropologists got some important things right, like Weidenreich. The recent genetic analyses aren’t contradicting those “old guesses”; they’re confirming them. Sometimes, partly, often not. It’s quite crazy to talk about trihybrid theories when we can instead talk about genetic data. You’re not seeing the forest for the trees. Are you a polycentrist Greg? Or are you just trying to tweak folks tails? Australian aboriginal languages have similar phonological systems to the Dravidian languages (my authority is RMW Dixon but I have not got the reference). Dixon dismisses this as a coincidence, but perhaps it is not coincidental after all. Various people have suspected some kind of connection for a long time. Similarities between present-day Dravidian languages and Australian languages, which are genetic and not coincidental, are likely due to a Vedda-like substrate in the former. What about the ‘Eden in the East’ people from areas of Southeast Asia submerged when the last Ice Age melted? Or do the pros call that horse poo? Australian aborigines are famously gerontocratic. Elders have great troves of sacred, top secret knowledge that they pass on to boys and young men in harrowing initiations. They seem to go in for this more than most any other hunter-gatherers. Just suppose: the Indian mariners who were shipwrecked in Arnhemland, fearful of descending into savagery, decided that it was vitally important to pass on their wisdom to the next generation. They had no writing but set up a whole ritual system to make sure this would happen. After 4000 years of Chinese whispers, little of the original information survives. But, just maybe, an Australianist who really knew the material and was asking the right questions could discover something unexpected in the tales of the Dreaming, and the songlines, and the Rainbow Snake. Italian winemakers used to do that too. Allegedly their most treasured secret was “You can also make it from grapes”. The rainbow = snake motif found in Australia is also found some places in India, but lots of other places too, so it isn’t evidence for much on its own. So, what would be the secrets a crew of bronze age sailors would want to pass on in a stone age environment? Early Abos were Early Stone Age. Late Stone Age merges with Early Copper, like the Mex archer’s city-state that provided Cortez with 40,000 copper crossbow bolts and a division of archers at a month’s notice. What did bronze age do better? Beats me (but I bet they knew, like those dang hippy long-hair girls knowing who the dang hippy long-hair boys are). What did Late Stone Age do better than Old Stone Age? Everything. Even Egyptian UFOs are cooler. I find it hard to put much stock in a number of the ADMIXTURE figures they’re waving around, really… I mean, having Tibeto-Burman Aonaga (somewhere in the region of 80-90% East Asian last I saw over at Zack’s blog) come out looking not all that different from south Indians would seem to be a good indication of insufficient K.
with a higher level of the main North East Asian associated components (i.e. scarcer in South East than North / Central East Asia) 84% than any population but the Japanese (including more than Beijing Chinese, 76%), and a higher level of the Siberian associated components than the North Chinese (7% vs 3%), but also with a higher South Indian component (5% vs Chinese 0% and Thais and Cambodians 10-14%). The Nysha are likewise in Zack’s ADMIXTURE plots. So the behavior of these populations in the ADMIXTURE and frappe here seems unusual. That would be a pretty extreme example of the ways older males use cultural warfare when competing with younger males over access to females but on the face of it it sounds possible. I like the portrayal of the story presented here much more than in the article I read in the Economist about the same subject. It isn’t easy to explain how Indian colonists could account for a fairly big fraction of Australian Aboriginal ancestry while at the same time leaving no archeological record and transmitting only a small fraction of their technology. Info is incomplete, but it sure looks as if the gene flow was all male as well. Next, the dingo gene pool is extremely bottlenecked: a single mtDNA type. Sure suggests a single visit. Extreme backwardness (MSA tech) of the Old Australians helps make the scenario feasible. Lastly, there are those tantalizing similarities between Pama-Nygunhan and Dravidian. The scenario I describe is the only feasible one that occurs to me, but who knows? it is possible though: foragers can expand in ways that limit gene flow from the earlier inhabitants, like the Thule vs the Dorset, or anatomically modern humans versus Neanderthals. If people mated randomly, you would have had to have thousands of Indian immigrants to end up with the ancestry numbers we’ve got today. By “microlithic stone tools” you are presumably referring to Bondi points, which do, in fact, appear around that time in the vicinity of Arnhem Land. But those are best described as extremely primitive. I don’t disagree with the general thrust of the narrative, but I’d reformulate this away from the idea of “a ship from an Indus civilization about 4000 years ago” and perhaps towards “a raft with some lost fishermen about 6000 years ago” . 4K BP in India, particularly, in the Indus valley, is a fairly advanced stage of the Bronze Age and I don’t believe that there’s anything of a kind seen in Australian archeology. Even accepting that newcomers rapidly lose most of their knowledge and technology, there should be more evidence left from such a contact. (And I’d think that Bronze Age Indians would do a much better job wiping out Australian Aboriginal tribes.) 6K BP, on the other hand, is late Stone Age / early Copper Age in the Indus valley and solid Stone Age further east. A few years ago, two Indian fisherman got drunk and washed up on North Sentinel Island in the Andaman Islands, home to one of the last out-of-contact Stone Age cultures on earth. The Sentinelese stabbed them to death with spears. Here’s a scenario. A ship from some Indian civilization about 4000 years ago [maybe Indus] loses its way and ends up crashing on the shore of Arnhem Land. Like most ships, its crew is all male. They survive the landing, and end up warring with a local tribe. Eventually, they kill off most of the men and annex the sobbing women. And most Australian natives, except in one corner of the continent, have wavy Caucasiod type hair, in stark contrast to the ancestral African-type spiral hair of New Guinea and, per historical records, the Tasmanians. So it would seem to post-date the separation of the land masses. So… it’s likely that it came with the Indic settlers. Question… how on earth did that wavy-hair trait, selectively sweep the whole continent in just a few thousand years? What was its advantage? The older men keep harems and monopolize the women. The young men have to wait for a geezer to die, in order to marry. This article I found somewhat degrading, I have always understood that advancement does not equal to honour and decency. DNA these days says that the Neanderthal came from Europe and those people with African ancestry do not have it. So if The DNA of Australia’s Indigenous people has Neanderthal blood it most certainly came from the Europeans. ” Neanderthal DNA in All Non-Africans” youtube and many other sites you can read from there, also Aboriginal Australians have what is called the eve gene mtdna. Europeans posses r1 dna Y Dna. If you are a truth seeker than it is important to get information that is not from Government research or the Smithsonian institute. Have a look at forbidden archeolgy it will blow your mind. The Indian blood came later and not all tribes in Australia have that bloodline, Tamil. If you research the languages different groups have similar languages and customs as do different parts of Africa. From Egypt, to Iran, parts of Indian Tamil, and Watusi Africa to name a few. There are people from ancient times who kept the knowledge from the beginning times and in order to this, so called advancement = loss of spiritualty and knowledge of the soul. If you learn to write you use a certain dna strand to enable that action at the same time another dna strand will not be used, one that is important to enable spiritualism. It is similar to a child that has autism who may not be able to speak as that part of the dna strand is not fired up. Instead another strand will be lit up one that enables the child to be a master mathematician or musician that can play orchestra music better than the professionals, or code cracker etc. There is so much more new information now concerning humans and timelines one should keep an open mind. You’re probably aware of this site – http://forgottenorigin.com/three-strikes-and-we-are-all-out-of-africa-and-into-australia-article but I’m curious if what they say about the Dingo DNA is correct and if so how does it square with you? Macro-Pama-Nyungan languages are rich in retroflex consonants, much the way South Asian languages are. Intriguing.